Explore the process of reinvention in the digital age as it relates to career, creativity and technology impact on daily life. Interview with professionals, entrepreneurs and creatives who have reimagined success and are making a pivot. 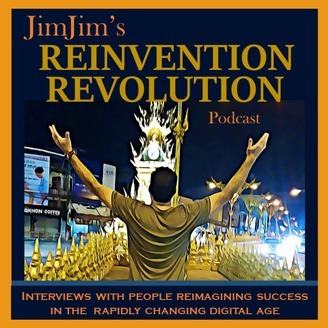 Hear insights about their inspiration, turning point and how the new digital world has inspired or forced a new outlook. Subscribe for weekly interviews about Reinvention, Creative Inspiration, Motivation, Breaking Through, Digital Landscape and Entrepreneurship. Reinvention, Reimagine, Turning Point, Re-brand, Technology Impact, Entrepreneur, Digital Age, Creativity Join the Revolution today. 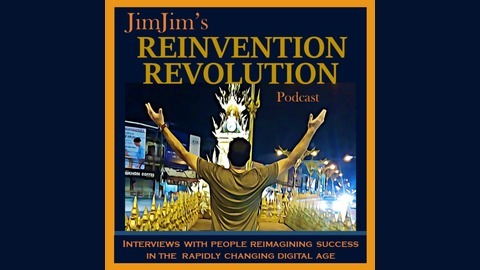 www.jimjimsreinventionrevolution.com www.facebook.com/jimjimsreinventionrevolutionpodcast. Ly ́dia Machová is an interpreter, a polyglot and language mentor that is reinventing language education. Listen to Ep50 as she describes her journey from interpreting and teaching English in her native Slovakia to developing her own language mentoring system and bringing it online. Recently a featured speaker at Nomad Summit 2019 Chiang Mai, Lydia, who speaks 8 languages, shares her thoughts on becoming an entrepreneur and embracing her new digital nomad lifestyle. Enjoy this ep? Share it with friends! Subscribe in Apple or Google Podcasts! Thanks to our Sponsor! Reach out for a free consultation.